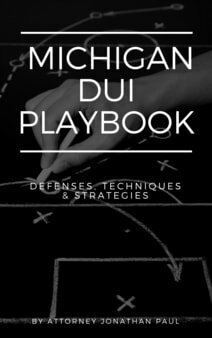 Michigan field sobriety tests can be either extremely damaging to your case or slightly helpful. In a perfect world, a defendant would not have submitted to any field sobriety test, because the police officer will always be able to find a few things that were done incorrectly, which are inferred means the defendant was intoxicated. There is no scientific evidence that these tests indicate someone is intoxicated or under the influence; many sober people cannot perform these same tests. The arresting officer will tell the defendant to recite the alphabet, sometimes starting and ending at different letters. If the defendant asks for clarification during the test, pauses or hesitates, the officer may mark the defendant as failing this test. The arresting officer should be cross-examined and admit alternative explanations for the defendant's supposed "failure" on the test. The officer and prosecution would have you believe a "failure" on this test equates to intoxication; this is not always true, and the arresting officer will leave open the possibility that performance was due to nerves, being unfamiliar with the process, and a host of other explanations. If the officer fails to acknowledge alternative explanations, your attorney can argue to the jury that the officer was so adamant about your guilt and building the case against you, that they would not even acknowledge other reasonable explanations. The arresting officer will ask the defendant to extend their arms and close their eyes; the defendant is then instructed to touch the tip of their nose. This technique has no scientific basis for testing for intoxication. There are a handful of alternative explanations for not performing well on this test; your attorney will explore these possibilities, and the officer should admit that the alternative explanations are plausible. If the officer will not acknowledge these alternative explanations, your attorney will be able to argue to the jury that the officer was so adamant about your guilt and building the case against you, that they would not even acknowledge other reasonable explanations. "I had the opportunity of observing Jonathan represent a co-defendant in a difficult 3 count felony drug case. Through Jonathan's efforts all 3 felony counts were dismissed and client pled to a simple misdemeanor possession charge; a truly fantastic result for the client. I would without hesitation recommend Jonathan on a criminal matter"
"When I first met John, he was beating me up as a prosecutor. When I heard John became a defense attorney, I was elated for two reasons, first that I wouldn't have to go against him any more, and two, that anybody charged with a crime an Ann Arbor and Washtenaw County have an exceptional criminal defense attorney who gets the job done. As a defense attorney, John uses his extensive experience to craft solutions to tough cases. As a fellow defense lawyer, I rely on John's advice in my own cases. 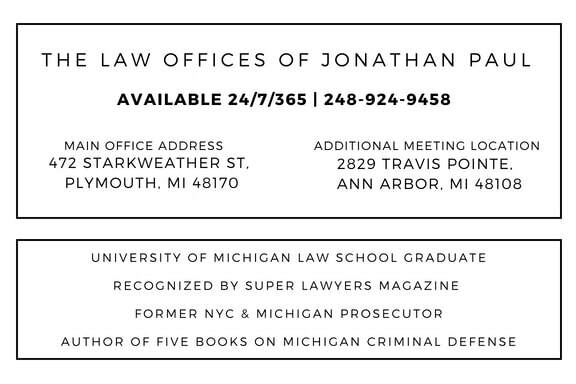 If you are in Ann Arbor and are in trouble, call John, he will help you"
"Jonathan is an extremely bright and talented criminal defense lawyer. His years of experience as a prosecuting attorney in New York and Michigan has already made him a top practitioner in his field. I happily endorse Jonathan Paul".